More than 35,000 Muslims will attend Jalsa Salana, the global convention of the Ahmadiyya Muslim Community, at East Worldham from August 3-5. The highlight of the event will be a mass pledge of allegiance to the World Head of the Ahmadiyya Muslims, His Holiness Hazrat Mirza Masroor Ahmad, that will commit his followers to an absolute devotion to peace. The pledge – known as the Bai’at – will take place just after noon on August 5, with all those present forming a human chain stretching out across the 210-acre site in a “simple, solemn and emotional” ceremony. Once united, they will make the pledge – led by His Holiness – which will be simultaneously translated into at least 15 languages and broadcast around the world to other Ahmadi Muslims via television or a mobile device. Instituted more than a century ago, the 10-point pledge commits every member of the community to a “jihad for peace” and includes commitments not to inflict injury on any of God’s creatures, to have sympathy for all of God’s creatures, and to devote one’s talents to their welfare. 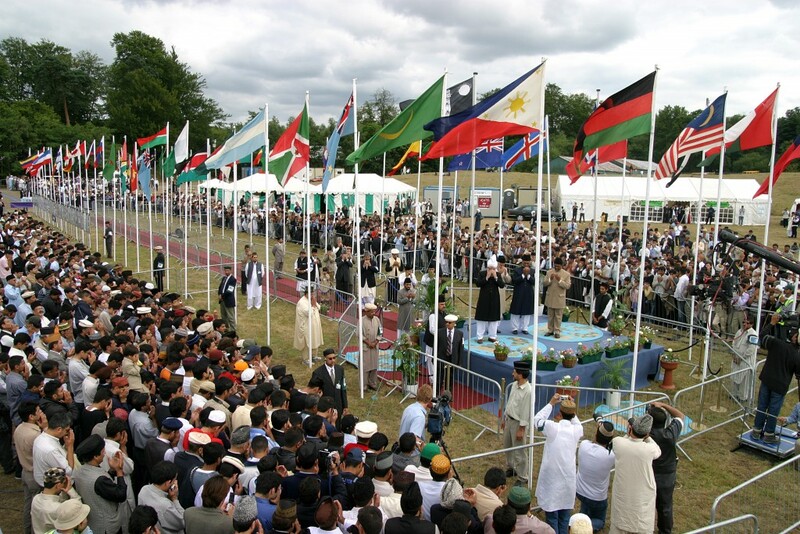 Rafiq Hayat, the UK president of the Ahmadiyya Muslim Community, said: “The Jalsa Salana, or annual convention of the community, is important for renewing ties and strengthening our faith. “It is also a public demonstration of Islam’s teachings of loyalty, as we raise the Union Jack as well as our community’s flag and celebrate the freedom of faith in the UK. Our faith makes us duty bound to serve the country to the best of our abilities. Faith, political and civic leaders will address Jalsa Salana, which aims to be a beacon for peace and promote good community relations under a banner of ‘Love for All, Hatred for None’.